It may still be Summer, but Fall beers are already starting to arrive. In case you hadn’t noticed, Pumpkin beers are making their way back onto store shelves, and I’ve seen one or two Oktoberfest releases out there as well. What’s with all these Fall beers coming back? The pumpkin ales are popping up everywhere, harvest ales are starting to show up, etc. They’re on schedule but, somehow, it just seems a bit too soon this year. I’m not done with my Summer yet! Well, it looks like Black Raven Brewing Company (CBM Sponsor) is about to add to my seasonal woes. 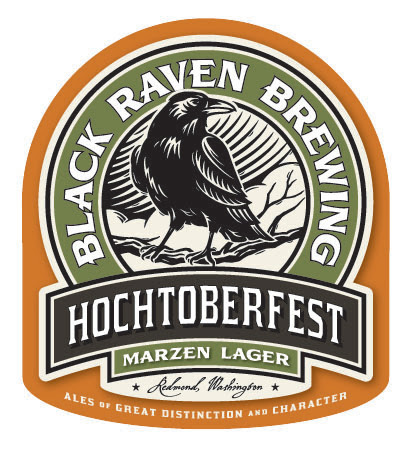 Set for release this coming Saturday, August 29th Black Raven’s Fall Seasonal Marzen Style Lager, Hochtoberfest, makes it’s return. Since I’m a fan of Marzen Style Lagers, however, I think I can forgive them for reminding me that Seattle Summer is winding down. This three-weekend festival, billed as “the next best thing to being in Munich!” will have four different venues this year, with loads of free entertainment, great food and great German beer. Also, following the German tradition, where the Mayor of Munich taps the first keg to kick things off, the Mayor of Leavenworth will hold a keg tapping ceremony at 1:00PM each Saturday during the festival. Don’t miss it! Be sure to take some time to also check out the City of Leavenworth itself. It’s a bit of Bavaria, right here in Washington with a real German feel and some great, authentic German restaurants. If you’ve never been to Leavenworth, I highly recommend checking it out. Oktoberfest, held each year in Munich (München) Germany, is the World’s largest fair, with well over 6 Million people in attendance each year. In fact, Oktoberfest 2010 had over 6.4 Million visitors who, all told, drank over 7.1 million liters of beer. Wow! I was fortunate to attend Oktoberfest in Germany back in 2009 while on a European vacation with my wife. It was an amazing and very memorable experience. If you have the means, I highly recommend braving the crowds to experience the true Oktoberfest in Germany at least once in your life. I’m sure I’ll be back again when the opportunity presents itself. For those of us who can’t always get to Germany for this incredible annual festival, there are several local options that will let you enjoy a bit of the feel and flavor of Oktoberfest closer to home. 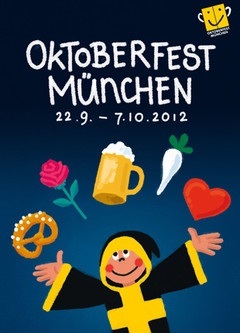 The true dates for Oktoberfest 2012, as you can see from the poster above, are September 22nd to October 7, 2012. Many people are not aware that Oktoberfest always starts, not in October, but in September. It ends the first week of October, and usually earlier than the 7th (click HERE to see the annual dates for Oktoberfest in Germany through 2015). Here are six places where you can celebrate Oktoberfest right here in Washington State. This is not an exhaustive list of all Oktoberfest celebrations happening in Washington; just a few options for you.